Visible satellite and ship reports show that a new tropical depression has likely formed in the deep tropics. A ship to the southeast of the circulaton shows a southwesterly wind would suggests a closed circulaton. Deep convection is also building south and west the circulation. Because of these reasons, I believe that a new tropical depression has formed. 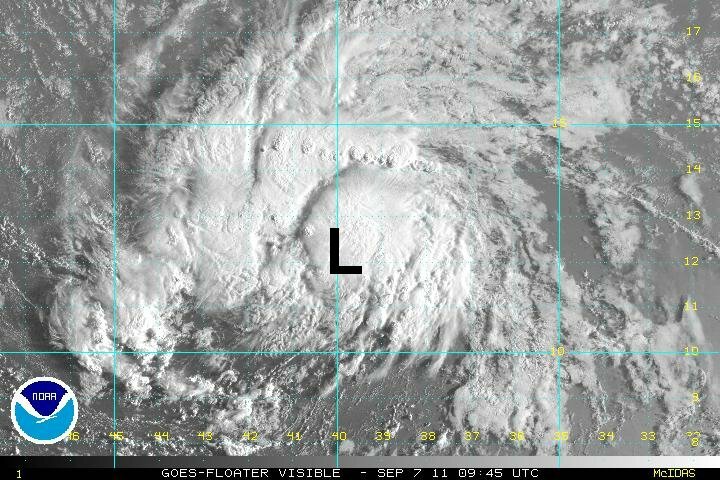 NHC is usually a little slower to classify systems like this until they are totally sure. At 7 am edt / ast the tropical disturbance was centered at 11.0 N / 33.3 W or roughly 700 miles southwest of the Cape Verde Islands / 1750 miles east of Barbados. Top sustained winds 25 mph. Movement west at 15 mph. Pressure estimated at 1008 mb. Long range forecasts this disturbance generally west then west northwest toward of just north of the Leeward by this Friday / Saturday. Intensity forecasts are not that reliable since the low is in its developmental stages. The disturbance in the deep tropics is definitely a tropical depression and is on the verge of becoming tropical storm Maria. NHC will (should) upgrade at 5 pm edt. I'll post a detailed forecast later this evening. The hurricane center upgraded to tropical depression 14 as expected. 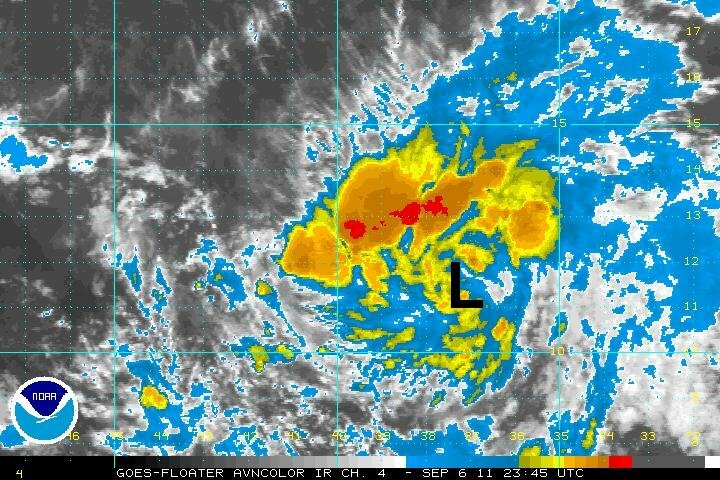 Convection is increasing slowly and should be near tropical storm strength by tomorrow morning if organization continues. 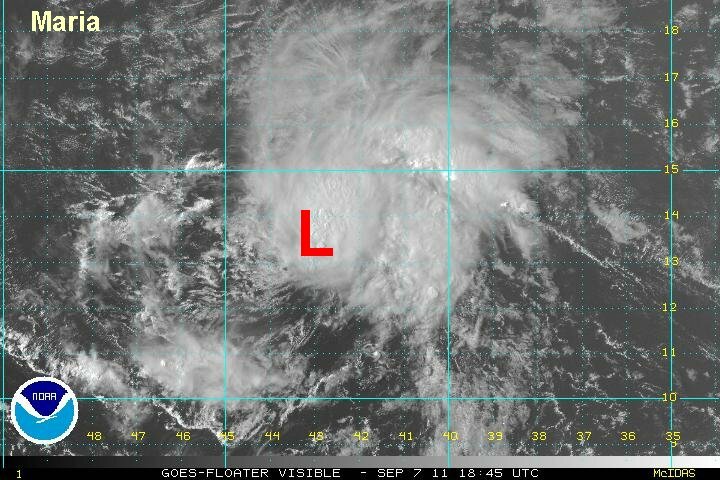 At 8 pm edt / ast 1450 tropical depression 14 was centered at 11.4 N / 37.6 W or roughly 1750 miles east of Barbados. Top sustained winds 35 mph (NHC 35 mph last aadvisory). Movement wnw at 18 mph. Pressure estimated at 1008 mb. 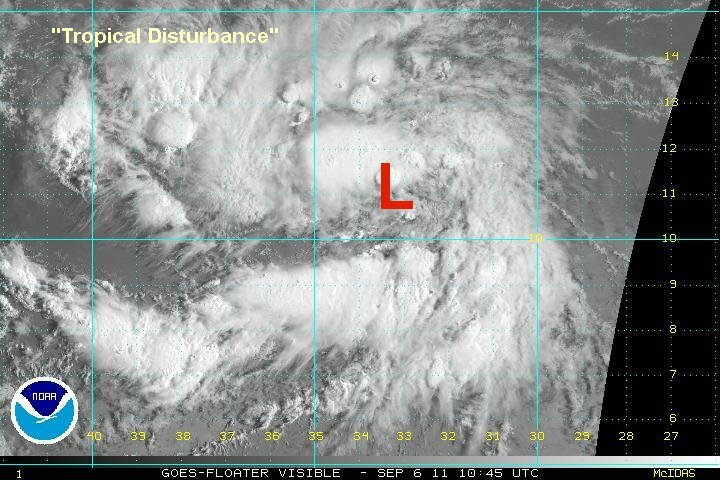 Long range forecasts this disturbance generally west then west northwest toward or just north of the Leeward by this weekend. Some models turn (Maria) toward the north east of the Bahamas and others through the northern Caribbean. It's too early to tell. Deep convection has increased overnight sufficiently so that I now believe that tropical depression 14 can be upgraded to tropical storm Maria. Maria has a large circulation and should gradually strengthen to become a hurricane, possibly before reaching the area near the Leewards by this weekend. The hurricane center is very slowly strengthening Maria due to the fact that all computer models don't show much strengthening. This is the achilles heel of the computers, in that there really isn't one that can predict strength well. 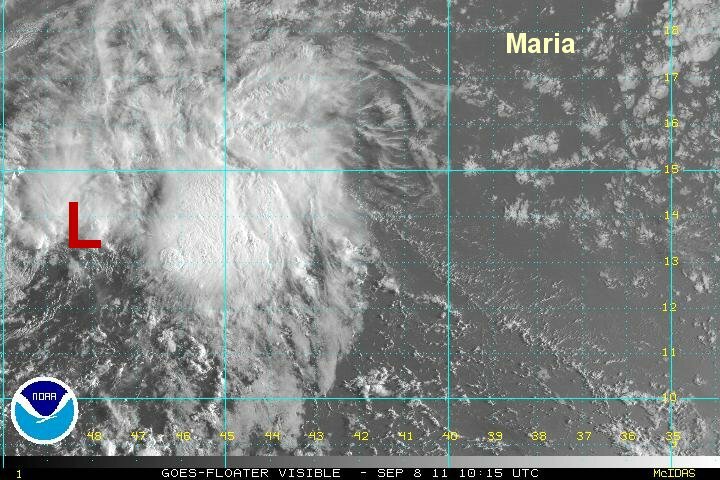 The satellite shows little shear, in the near future, so I think Maria may strengthen ahead of the curve. At 7 am edt / ast tropical depression 14 was centered at 12.0 N / 40.0 W or roughly 1280 miles east of Barbados. Top sustained winds 40 mph (NHC 35 mph last advisory). Movement wnw at 20 mph. Pressure estimated at 1005 mb. Long range forecasts take TD 14 (Maria) west northwest toward or just north of the Leeward by this weekend. Some models turn (Maria) toward the north east of the Bahamas and others through the northern Caribbean. It's too early to tell. Satellite imagery show dry air and some wind shear affecting the western half of Maria's circulation. Despite this, outflow aloft is excellent on the eastern half of the circulation and is allowing for strengthening today. Maria will likely continue fighting the dry air to the west. Slow strengthening is still possible and it's not out of the realm of possibility that Maria could be a hurricane as it passes near the Leewards in a few days. 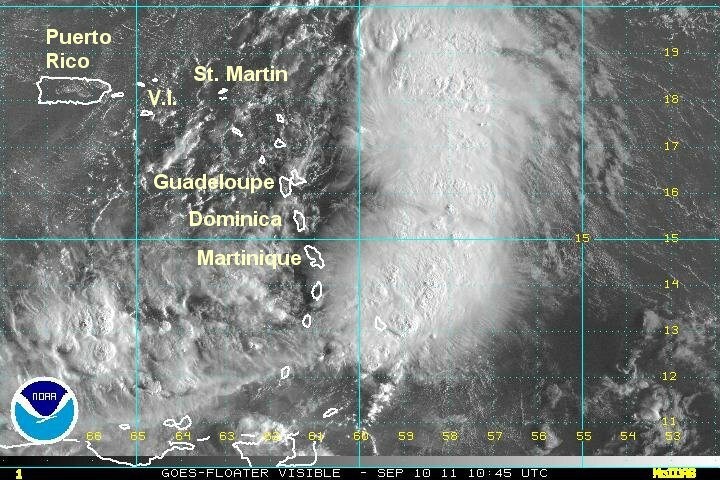 At 4 pm edt / ast maria was centered at 13.4 N / 42.8 W or a little less than 1100 miles east of Barbados. Top sustained winds estimated at 55 mph (NHC 50 mph last advisory). Movement wnw at 23 mph. Pressure estimated at 1001 mb. Long range forecasts take Maria west northwest toward or a little north of the Leewards by this weekend and have Maria affecting the Leewards late Friday into early Sunday. By Sunday most models turn Maria toward the north - east of the Bahamas and possibly in the general direction of Bermuda a few days later. It is still too early to tell if the Bahamas will have significant effects. Interests in the Leewards, Bahamas and Bermuda should follow the progress of Maria. Maria has been moving quickly for a tropical cyclone in the deep tropics at over 20 mph. It is not unusual to see systems like this struggle to intensify with this fast motion. Deep convection is still associated with Maria, but strengthening has been limited from an upper air trough to the northwest. Forecast models have been holding off the strengthening for the next several days and it is due to this upper air trough. The visible satellite shows a low center that is not very impressive with most of the ddep convection well to the east. A recon will give us a better idea of the structure later today. Maria is not looking too good right now. NOAA wave forecasts have the seas at 15 feet +. At 7 am edt / ast maria was centered at 13.5 N / 48.4 W or a little over 900 miles ese of the Leewards. Top sustained winds estimated at 45 mph (NHC 50 mph last advisory). Movement wnw at 23 mph. Pressure estimated at 1002 mb. Long range forecasts take Maria west northwest toward Leewards by this weekend and have Maria affecting the Leewards late Friday into Sunday. By Sunday most models turn Maria toward the north of Puerto Rico and east of the Bahamas and possibly in the general direction of Bermuda a number of days later. One model has it affecting the Bahamas Mon-Wed before turning it north. It is still too early to tell if the Bahamas will have significant effects. I don't believe that Maria is a tropical storm any longer. Shear has completely exposed the center. I'll post a full update later this afternoon / evening. The visible satellite confirms that Maria is not longer a storm. The low level circulation is very discernable, but small and with out convection for the last several hours. NHC generously kept it as a storm. They will down grade to depression status shortly. The past hour convection is developing near the center again, but not enough IMO to classify this as a storm. 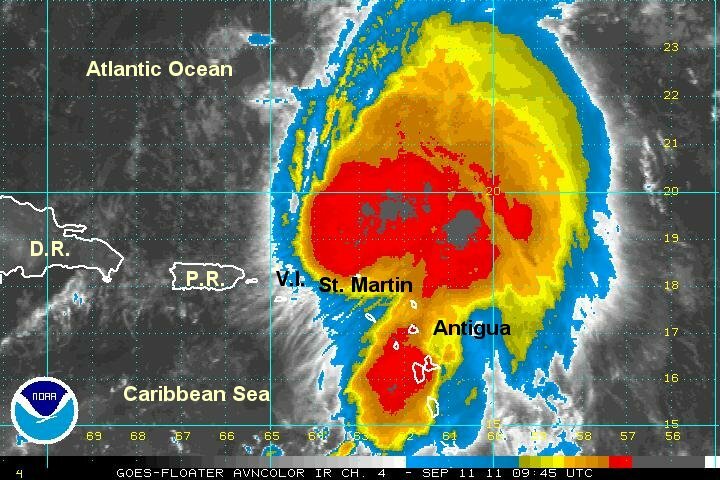 At 5 pm edt / ast Maria was centered at 13.2 N / 52.7 W or about over 560 miles east of the Windwards. Top sustained winds estimated at 35 mph (NHC 40 mph last advisory). Movement wnw at 21 mph. Pressure estimated at 1006 mb. Maria went to having its circulation completely exposed last evening to a large mass of convection early this morning. Maria is becoming better organized, and is gaining some strength now with a large mass of convection associated with it. 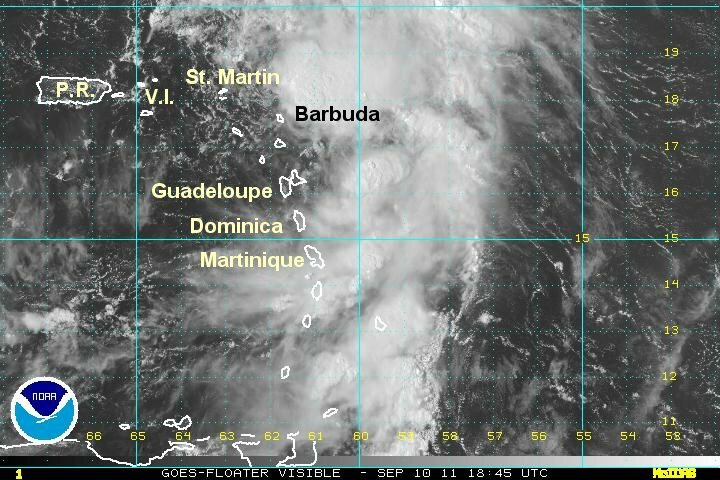 This will mean that the winds will start to pick up on the northern Windwards and Leewards some today. The main effect will be the heavy showers which will increase in intensity today. At 6 am edt / ast Maria was centered at 13.8 N / 56.3 W or about over 425 miles ese of the Leewards. Top sustained winds estimated at 45 mph (NHC 40 mph last advisory). Movement wnw at 18 mph. Pressure estimated at 1002 mb. Long range forecasts have Maria affecting the Lesser Antilles into Sunday. By Sunday most models turn Maria toward the north of Puerto Rico and east of the Bahamas and possibly in the general direction of Bermuda a number of days later. One model has it affecting the Bahamas Mon-Wed before turning it north. It is still too early to tell if the Bahamas will have significant effects. Interests in the Leewards, northern Windwards, Bahamas, Southeast U.S., and Bermuda should follow the progress of Maria. Friday evening update was deleted by computer glitch....sorry. I know, a crazy headline this morning. Very true though. I am asking the same questions as the hurricane center did earlier. The hurricane center was baffled if Maria was even a storm and where it might be located. I have the advantage of being able to look at a few visible satellite pictures to know that their position estimate was not right. There is a vorticy near the Leewards, possibly another (which I deemed the low center) near the edge of the convection, and yet another spin about 50 miles farther northeast well into the deep convection. What does all of this mean? It means that Maria is not well formed. 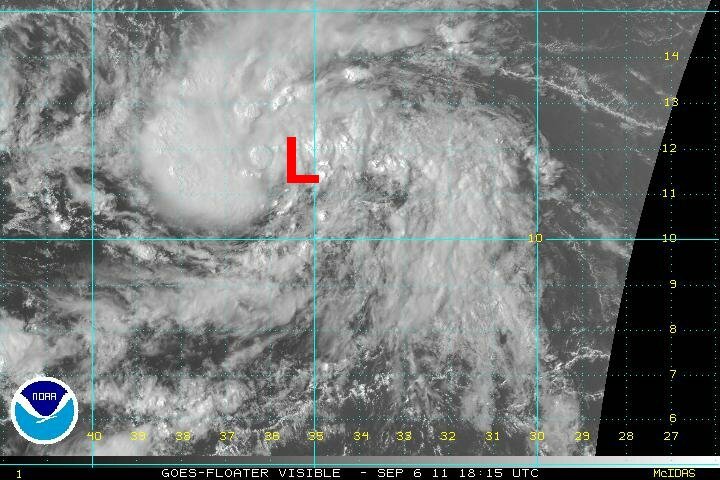 I suspect that the new low center is trying to form under the deep convectiion to the northeast. It is probably a mid level low that is trying to work its way to the surface. This doesn't happen too often, but this may be one case. The hurricane hunter will be investigating soon to let us know more about the structure of Maria. 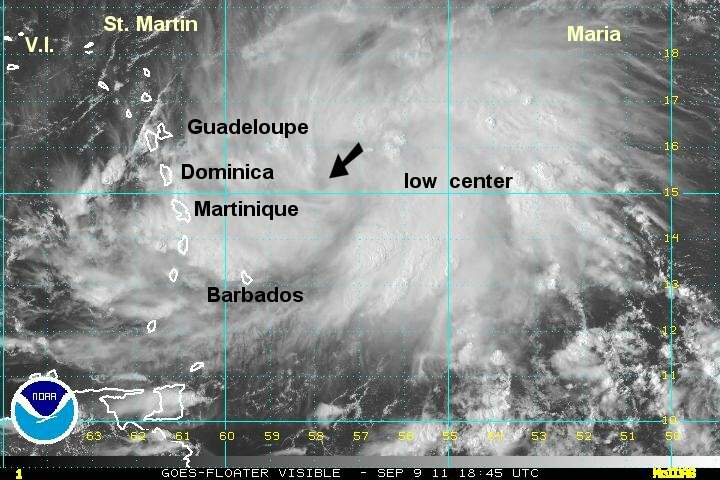 At 8 am edt / ast Maria was centered at 17.0 N / 60.0 W or about over 100 miles ene of Guadeloupe. Top sustained winds estimated at 45 mph (NHC 45 mph last advisory). Movement nw at 14 mph. Pressure estimated at 1005 mb. Forecasts have Maria affecting the Lesser Antilles into Sunday. By Sunday most models turn Maria toward the north of Puerto Rico. Maria will likely move near or east of the Turk and Caicos late Monday then start turning north and away from the area during Tuesday. The southeastern Bahamas and Turks and Caicos will probably see some effects. It will depend on how large and strong Maria is at that point. Maria is forecast to then move northeast possibly in the vicinity of Bermuda by around Wednesday or Thursday. Maria is not a tropical storm and possible not even a depression. It's difficult to say if a low level circulation is still present. Heavy showers and storms remain mostly east of the Lesser Antilles. The forecast track is almost meaningless at this time as Maria may not even be a closed circulation. At 4 pm edt / ast Maria was centered at 17.8 N / 62.4 W or between St. Martin and Barbuda. Top sustained winds estimated at 30 mph (NHC 40 mph last advisory). Movement nw at 15 mph. Pressure estimated at 1007 mb. Forecasts have Maria affecting the Lesser Antilles into tomorrow. By Sunday most models turn Maria toward the north of Puerto Rico. Maria will likely move a little east of the Turk and Caicos late Monday then start turning north and away from the area during Tuesday. The southeastern Bahamas and Turks and Caicos will probably see some effects. It will depend on how large and strong Maria is at that point. Maria is forecast to then move northeast possibly in the vicinity of Bermuda by around Wednesday or Thursday. Wind shear is dying down a deep convection is once again trying to make a comeback. The low center in the extreme northeastern Leewards. Maria, get like a few days ago is restrengthening after being badly sheared. Maria's life has been marked by weakening and strengthening cycles as it has battled windshear. Again, once more Maria has revived from another near death experience. 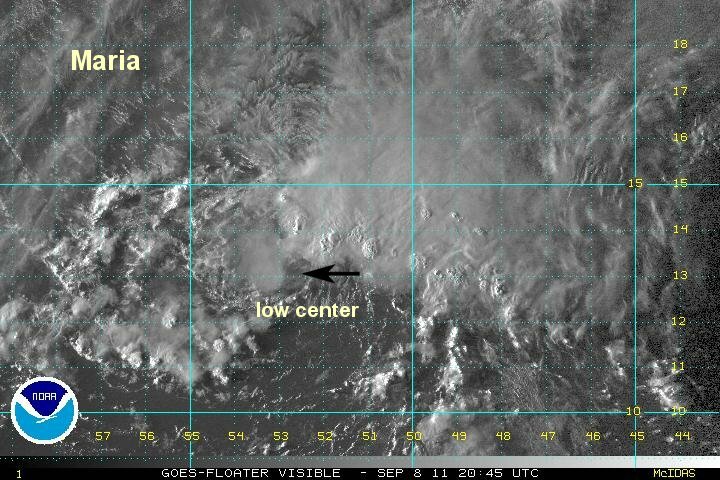 It looks like maria formed a new circulation center under the deep convection to the northeast of the original low level center. If you recall, the forecast track from NHC took Maria through the Leewards into the northeastern Caribbean. A very weak low was visible yesterday moving in this direction with the most impressive convection and mid level rotation to the northeast. I believe that the original low dissipated and a new low formed farther northeast. This is the only way to explain what we have observed. Maria is still being sheared with the low just north of the Leewards. Most of the rough weather is to the north of the Islands. A check of winds show St. Martin to Dominica reporting winds 15-20 mph.... a normal day. Thundershowers are being observed in the Leewards with scattered heavy showers. At 7 am edt / ast Maria was centered at 19.1 N / 63.8 W or 75 miles ene of St. Thomas, V.I.. Top sustained winds estimated at 60 mph (NHC 60 mph last advisory). Movement nw at 13 mph. Pressure estimated at 1004 mb. 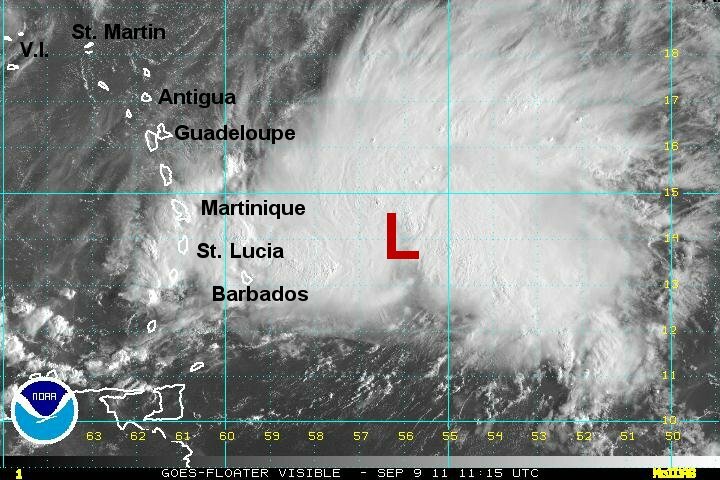 Maria will be pulling away from the Leewards today. The effects will gradually diminish into Monday. Maria will turn east of the Turks and Caicos and southern Bahamas during Monday and Tuesday. The southeastern Bahamas and Turks and Caicos will probably see some effects depending on how large and strong Maria is at that point. Maria is forecast to then move northeast possibly in the vicinity of Bermuda by around Wednesday or Thursday.